The Mindray Beneheart D1 Public Semi Automatic Defibrillator helps you to respond to Sudden Cardiac Arrest in a variety of locations. 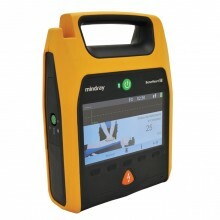 It is designed to be reliable, simple and easy to use by any rescuer. The disposable battery with extended capacity supports more than 300 shocks at 200J as well as 12 hours of ECG monitoring. Click the button below to add the Mindray BeneHeart D1 Public Automatic External Defibrillator with ECG Monitor to your wish list.